When I think of Dana Galvin Lancour, FSMPS, CPSM, the word “build” comes to mind. And it’s not just because she’s a longtime team member at Barton Malow Company, a national construction firm. Dana has built a successful career and a strong personal brand, and she builds up others through her efforts. Over the past several years, I’ve collaborated with Dana on initiatives for the Society for Marketing Professional Services and other organizations. As early adopters of social media in the design and construction industry, along with Adam Kilbourne, FSMPS, CPSM, we co-researched and co-wrote a white paper on the topic for the SMPS Foundation Whitepaper. We’ve also presented together for SMPS, AIA, and Engineering News-Record’s Groundbreaking Women in Construction conferences. Through these interactions, I’ve observed Dana’s humble, yet driven approach that makes a lasting impact on both her company and her industry. Dana is a great example of a marketer who has grown into a key leadership role that impacts her firm on many instrumental levels. As senior director, marketing & communications at Barton Malow, she leads a robust team as well as a range of initiatives that includes workforce engagement—an ever-important issue that has become critical in today’s climate. Her leadership sets a positive example for professional services marketers to lead strategic efforts for their companies. Quick with a smile and encouraging words, Dana takes a genuine interest in others and their success. Through mentoring efforts and a long list of publications and presentations, Dana generously shares her expertise and knowledge, helping others learn from her expertise. In an effort to recognize and celebrate the excellence of marketers’ work, she initiated an awards program for SMPS Michigan, and four years later, led its transition into a regional program. It’s now a key part of the Heartland Regional Conference, and I’ve seen firsthand the positive impact it makes, recognizing marketers’ accomplishments and inspiring them to excel in future efforts. Dana says it can sometimes be challenging to be a woman leader in the male-dominated architecture, engineering and construction industry, but the key is to stay positive and focused on what you can impact and control. I appreciate Dana's friendship and leadership and how she has inspired me to stay positive and to keep building! The magazine Civil + Structural Engineer recently named Carrie Walden, PE, senior project manager at CE Solutions, as one of their 2017 “Rising Stars in Structural Engineering.” From what I witnessed working with her at CE Solutions for eight years, she has been a rock star for a long time. When it comes to providing professional services—like that of structural engineering—the technical solutions are only part of the equation. Carrie has always impressed me with her ability to solve complex problems and effectively communicate with her clients and consultants. All the while, she builds lasting, genuine relationships by the way she interacts with people and how she truly cares about their wellbeing. Carrie and her family have moved to different cities and states over the years, but she has remained a dedicated employee of CE Solutions, mastering the challenges of working remotely before the concept was common. And while I already had respect for Carrie, it multiplied even more after I observed her in action, doing fieldwork for one of her concrete repair and restoration projects—conditions that definitely require some grit. Carrie and her son Alex. 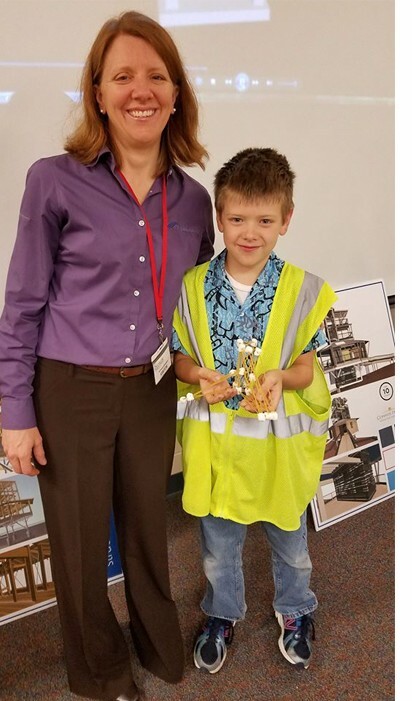 In addition to being a wonderful mother to her three children, Carrie invests in the future generations by regularly visiting elementary schools to teach students about structural engineering. 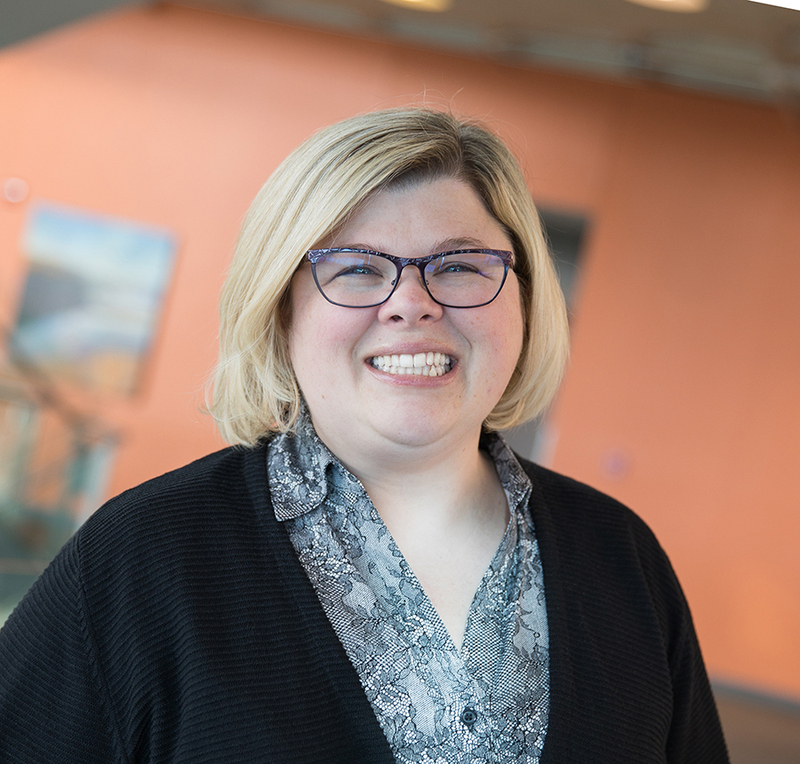 For the last two years, she has led CE Solutions’ participation in “Passport to Hi Tech.” The event at Conner Prairie is geared toward getting girls interested in careers in science, technology, engineering, and math—fields that need more women represented. "Success is rarely a single event by a single person, but rather consistent effort over a course of time with many influences and impacts from other people along the way,” Carrie said. Often inspired by scripture, she encourages others to “...run with perseverance the race marked out for us (Hebrews 12:1)." Congratulations to Carrie for being named a Rising Star and being an inspiration to women in the design and construction industry, both for today, and tomorrow! I was attending the 2015 banquet for the Indianapolis ACE Mentor Program, when a confident, articulate high school senior approached the microphone to present her school’s project. I immediately became a fan. Kathy made such an impression on me that when I was chairing a seminar, “What’s on TAP 2016,” she instantly came to mind to address our theme of attracting and retaining talent in the design and construction industry. At conferences and programs, we typically hear from post-college professionals, but I wanted a speaker who represented the next generation. As expected, Kathy’s presentation was the perfect finale to the event. Her take on industry opportunities and hurdles combined with her energetic delivery and stories made for an unforgettable presentation. I’m grateful that D Scott Media, Inc. recorded Kathy’s presentation at “What’s on TAP” and am happy to share it with you as part of this month’s feature. Since then, I’ve kept up with Kathy and her path. An incoming junior majoring in construction management with minors in business administration and communications, Kathy has already gained exposure to multiple facets of the industry, having worked for Repro Graphix and served two internships—one at ERMCO in Indianapolis and another she’s currently wrapping up at Turner in San Antonio. 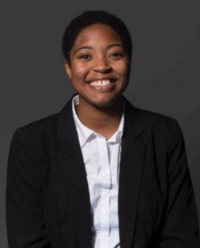 She’s attended Greenbuild, given more presentations, and continued her involvement in the campus residence hall and student government associations, all while working for Chick-fil-A and as a student crew leader for Ball State Dining. Kathy has a lot going on and—to take cues from her TAP presentation—I’m thrilled that she decided to play (and excel!) in the design and construction industry sandbox. As I’ve gotten to know Deb in the years since, that admiration has only amplified. In founding CORE, she’s assembled a top-notch team of professionals that combine their technical expertise with a strategic approach to help owners manage the complexities of site development and facility projects. In addition to her busy schedule advancing projects for owners, she also helps advance careers through mentoring and serving in multiple professional and community organizations. In the following video, Deb talks about how she advanced her own career by discovering what she was passionate about and how that aligned with her technical skills. What about you? What do you love about your profession? How can you translate that into value for others? The final 3chord Marketing logo (top left), the first iteration (bottom right), and a peek at how we got there. Nearly one year ago, I was sitting at a local restaurant with my colleague, Travis Davis—a talented designer and my coworker at CE Solutions. We were meeting to brainstorm logo ideas for soon-to-launch 3chord Marketing. I wanted a logo that was consistent with my personal brand. And given the musical metaphors behind the company name and considering my fascination with logos featuring hidden messages—I wanted to have some fun with the symbol. With brews as our muse, Travis and I sketched out logo ideas that incorporated guitar picks and music notes, but kept coming back to my favorite concept—a guitar body outline creating the three in 3chord Marketing. We came up with a concept we both liked, high fived, paid the tab, and Travis’ next step was to translate our sketch into a graphic with the help of his design software. After Travis drafted the logo, it was time to get feedback. We looked at the logo and clearly saw “3chord Marketing,” but wondered… what about people who didn’t know the company name? They didn’t see the three. And it was interesting to witness their reactions. When I asked people if they could tell what the logo said, most of the time, they replied, “yeah, Chord Marketing!” But to the people who knew my company name, the three was obvious. “How did they not see it was a three? !” a family member asked. The reason: a cognitive bias called the Curse of Knowledge. When we know something others don’t, we forget what it’s like not to know, and we subconsciously assume others understand the situation at the same level we do. That did the trick. Right away, people I surveyed responded with the correct company name. On a macro level, conduct internal and external perception surveys to understand your firm’s reputation and compare it to your own understanding and assumptions. Where are the gaps? Use specificity and the power of stories to provide clarity in your content. Engage contacts who haven’t been involved in your project (like my logo reviewers hadn't) to review your messaging or approach and provide feedback on how it resonates. The Curse of Knowledge is common, and with today’s multitude of interactions and the speed of incoming information, opportunities for miscommunication abound. But being aware of this bias is the first step in addressing it. What techniques have you found helpful in addressing the Curse of Knowledge? The barbs are worth it to get to the other side. My mom still lives in the house I grew up in, five miles outside of my Missouri hometown. The house and its flower-filled yard, along with two bayed buildings now used for storage, front an acre of timber where the sun sets. When I go back to visit, I retrace the paths I traveled as a kid, like the trail that led the way from the house to my dad’s shop, where he repaired and restored cars. And the path to the barbed wire fence I would climb to explore our neighbor’s property. With streams, ponds, boulders and meadows--as well as wandering cattle that cut down the overgrowth--it was worth it to risk the barbs (and the chance of getting caught trespassing). My mom working in her office at UCM. I loved visiting her at work. My dad, a business owner who preferred writing on walls. (Those are pencil marks behind him). I inherited both traits. Crossing the fence to business ownership has been a goal of mine for a long time, and I met it in 2016 by starting 3chord Marketing. Maybe the entrepreneurial spark came from my late father, who started and ran his own auto body business. And my mom was instrumental in my journey, instilling in me the value of working hard and unwittingly putting me on a path to a marketing communications career. When she became a single mother, Mom started her career as an administrative assistant at the University of Central Missouri. While spending time at her office (usually after serving detentions and walking to campus to ride home with her), I’d envision the day I would go to college. To bring in more income, Mom sold Home Interiors, and I witnessed her presenting at meetings, helping customers and working hard to manage it all so we could keep the only home my sisters and I had known. All the while, the free time I had as a Gen X “latch key kid” was spent with my nose in a book or a pencil in my hand. While childhood wasn’t perfect (is anyone’s? ), the positive and negative experiences--and countless ones since--were all critical parts of my path. In the years since, the people I’ve met along the way have been instrumental to every accomplishment. During the beginning of each new year, mantras and advice abound, like “live in the moment” versus dwelling in the past, and “approach every day with a spirit of gratitude.” While mindfulness and gratitude are important, reflecting on the paths we’ve traveled and the relationships we’ve built should be part of the process, helping us appreciate where we are now while inspiring us for the future. As da Vinci said, everything connects to everything else. What were some of the positive experiences and successes of 2016? How did they come about? Why were they positive? What were some of the challenging moments of 2016? What did you learn from them? How can you apply what you’ve learned from both the positive and challenging experiences to your personal and professional goals and action items for the future? I find this activity to be motivating and fulfilling to do during the transition to the new year, storing the top moments, lessons learned and goals in an easily accessible Google Doc I can review and update periodically. If you take me up on this challenge, drop me a note and let me know what you think. And if I can support you in any of your goals, let me know that, too! Wishing you all the best as you travel your paths in 2017.